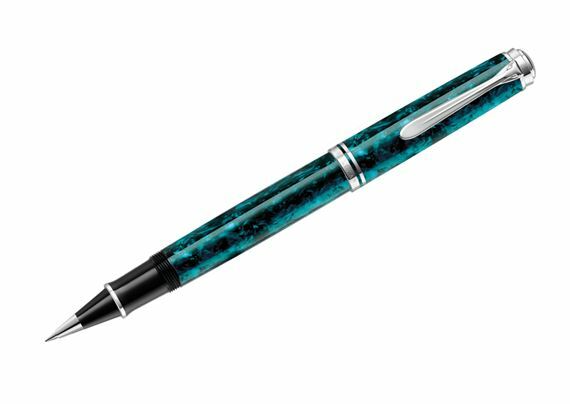 Order your Pelikan Souveran R805 Ocean Swirl Rollerball today from FahrneysPens.com. Fine Pens, Refills & Luxurious Gifts – great prices & fast shipping. Pelikan brings the beauty and charisma of the open seas to your writing experience with its new Souverän 805 Ocean Swirl special edition series. The limited production, oversized 805 fountain pen, capped rollerball and twist ball pen offer a new finish that is crafted in a unique material that gives a truly spectacular look on each Ocean Swirl writing instrument. Exposure to light further enhances the surface appearance adding sparkle and depth; alternating bright and dark patterns mimic the sun radiating on the deep blue sea making each writing instrument truly unique. The Ocean Swirl pen body is accented with silvery palladium-plated rings and ‘beak’ clip. The exceptional 805 fountain pen has the brand’s patented differential piston filler. It’s equipped with Pelikan’s finest rhodium-plated, 18K gold nib offered in four point widths to match your preferred writing style. Presented in an elegant gift box, the 805 Ocean Swirl is available for a limited time only.